This is not the century of the piggy bank. It’s totally old fashioned, totally out of date. And so must the persons be who collect them (?). People don’t use piggy banks anymore. Money is a number in a database in virtual banks. No money to count ‘live’ anymore, no more tinkle of coins. No bank to shake the coins out. 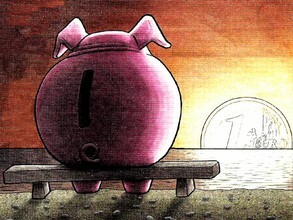 No more waiting untill the bank is full, but spending money that you expect in the future or even borrow it. The old fashioned piggybank also had an educational task. Fill it coin by coin and wait patiently until it is fully loaded. And then: smash the bank. As if it were the slaughter of a real pig. The times are not favourable for piggy banks, therefore it’s ok that there are collectors who acknowledge the piggy banks as heritage worth saving.